Scott, the upside of reviewing movies with you is seeing Kevin Hart in a dramatic role. Here he’s a broken Hart, Greg. Let’s see if he can be mended. Time to recap. We’re introduced to Phillip Lacasse (Bryan Cranston) a millionaire investor/writer who also happens to be a paraplegic who really wishes he could just die – so much so that he has signed a Do Not Resuscitate order (DNR). His assistant Yvonne (Nicole Kidman) is searching for a live-in caretaker. At the same time Dell Scott (Kevin Hart) is an out-of-work ex-con who has disappointed his ex-wife and son by being absent (both because he’s a deadbeat and because he’s been in jail). Dell has to get three signatures on job interviews or he’s broken his parole. On his third interview he accidentally enters Phillips study for the interview. Phillip decides to hire Dell in the hopes that he’ll be inadequate at the task and allow him to die. The two are clearly a mismatched couple and Yvonne does everything she can to prevent Dell from harming Phillip. She even threatens to fire him, except that Philip will not allow it. Dell learns that Phillip has a penpal whom he has never met. Against Phillip’s wishes, Dell forces the two penpals to meet, and the meeting ends in disaster. At first this incident appears to doom the relationship, but gradually Dell and Phillip begin to form an unlikely friendship. Scott, I was very fearful of this film. In my mind it had two strikes against it: First, we have to watch a skilled actor, Bryan Cranston, perform without the use of body language. And second, Kevin Hart is known for his over-the-top antics in such films as Ride Along and Night School. I was pleasantly surprised to find that Cranston is a very capable “head actor” and Hart is more than just a clown. Aside from that, this is a very straightforward buddy-movie / RomCom. While Hart is delivering a dramatic performance, his comedy skills allow him to deliver an authentic performance. Dell is disgusted at the prospect of having to clean Philip’s diaper and change his catheter. Hart’s revulsion is not the typical over-the-top reaction we’ve seen in his comedy roles. Instead we get a reaction that is hilarious in it’s honesty. After all, it was Charna Halpern, the mother of modern improvisational comedy, who said “there is truth in comedy.” I might add, there is comedy in truth. And Hart made Dell real without making him a caricature. Greg, I didn’t expect to be emotionally moved by a Kevin Hart film, yet that’s exactly what The Upside accomplished. This movie makes magic out of the frequently-used “odd couple” formula of teaming up two completely opposite people. Dell and Phillip are from contrasting worlds, one rich and one poor, one white and one black, one able-bodied and one paraplegic. They are brought together, not just by Phillip’s desire to die, but also by his yearning to help underdog people and businesses fulfill their potential. At the outset of the story, we don’t think much of ne’er-do-well Dell, but by film’s end he fulfills Philip’s vision by transforming into a man of character and integrity. The Upside is first and foremost a great buddy hero story. To no one’s surprise, our two heroes start out clashing but their relationship soon evolves, with some ebbing and flowing that turns turbulent at times. Our two buddy heroes each help one another find their missing inner qualities. For Phillip, his missing attributes are the ability to have fun and achieve intimacy with people. Dell helps Philip by showing him how to chill out, by allowing him to participate in “speed-wheelchairing”, and by setting him up with his penpal – a rendezvous that doesn’t work out yet does help Philip move forward with a “real” relationship with Yvonne. Dell’s missing qualities are his self-respect and financial independence. Philip helps him by giving him the job of caretaking him and by encouraging him, repeatedly, to follow his dream. While I enjoyed and was surprised by Cranston and Hart’s performances, I felt The Upside was a pretty by-the-numbers buddy story. And a pretty common handicapped vs. caretaker story. Regardless of the fact that it was based on true-life events, I was not overly moved by this film. In many ways it reminded me of 2017’s Me Before You. I can only award The Upside with 3 out of 5 Reels. This is a fine hero’s story as well as a classic odd-couple buddy story. You’ve nailed the transformation of these characters. And transformation is at the heart of a great hero’s journey. I give our buddies 4 out of 5 Heroes. Finally, the message seems to be that life is worth living even if you’re paralyzed. Or perhaps it’s that there is dignity in serving others. Dell becomes more attentive to his son after learning to take care of a man who is essentially an infant. I give the message 3 out of 5 Message points. 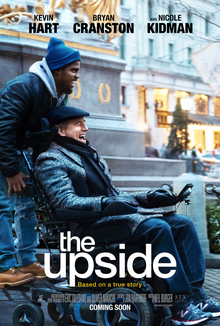 The Upside is surprising in offering an emotionally satisfying story about two broken men who have no business becoming friends yet somehow, through compassion and resilience, are able to forge a meaningful relationship. As you point out, Greg, Bryan Cranston delivers an extraordinary performance as a man who emotes only through his head. This is a stunning acting performance and sadly, Cranston is unlikely to receive any recognitions for this role. Our two heroes Dell and Phillip are a highly memorable pair and bring this film to life with their stirring, heartfelt performances. I give this movie 4 Reels out of 5. Our buddies here do what all good buddy heroes do – they help each other grow and evolve into the people they are meant to be. This is the core of this film’s strength. 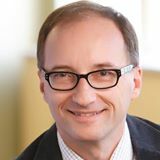 Every hero at the outset of a story is missing one or more key inner qualities, and we all need friends who can help us discern and obtain these missing pieces. Very few films portray this reciprocity better than The Upside. I give our heroes 4 Hero points out of 5. The messages of The Upside are that people are put on this earth to help each other, and that no matter how physically disabled or morally disabled we are, there are always opportunities for growth and redemption. Again, Cranston is brilliant in portraying his predicament and in making the most out of it — a wonderful and inspiring take-home point for us all. I give this message 4 Message points out of 5.